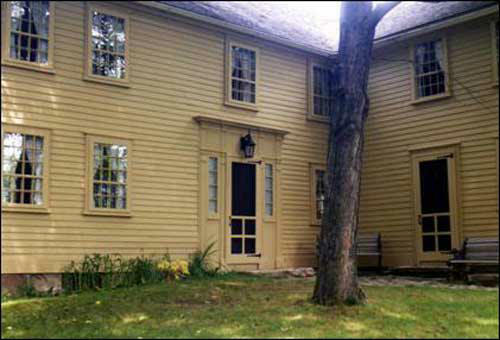 The historic Smith-Appleby House Museum located at 220 Stillwater Road in Smithfield, Rhode Island, is the headquarters for the Historical Society of Smithfield and is open to the public. It is a “country mansion” of sorts; a home that began with one room, and was added on to over the ensuing years, thus making it unusual for a house of its vintage. 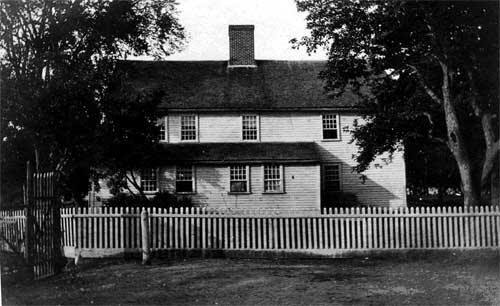 The oldest portion of the house dates to about 1696, built when Elisha Smith, (b.1680 – d.1766), came from Providence and constructed a single room home with a small loft, likely covered with a thatch roof. (Today this room is called the Keeping Room, and is the first stop when giving tours.) The house is said to have been a “stone-ender”, meaning, one wall was composed entirely of stone, which wasn’t unusual for the time. 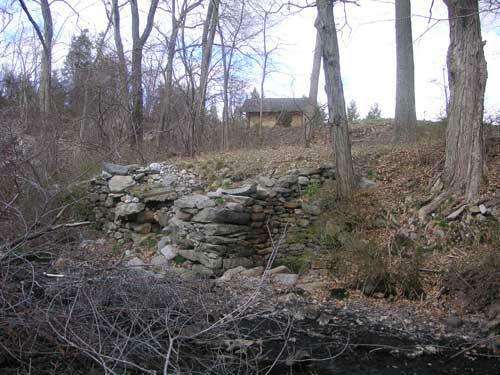 This stone wall contained a large fireplace used for cooking and heat. While there has been some debate in recent years as to the original house being a stone ender, the hearthstones, worn smooth by centuries of foot traffic, indicate they are original to the house. When visiting the Smith-Appleby House, stop to consider the conversations that have taken place in the Keeping Room. There people debated and discussed topics of their day such as the American Revolution, the American Civil War and slavery, as well as World Wars I and II. 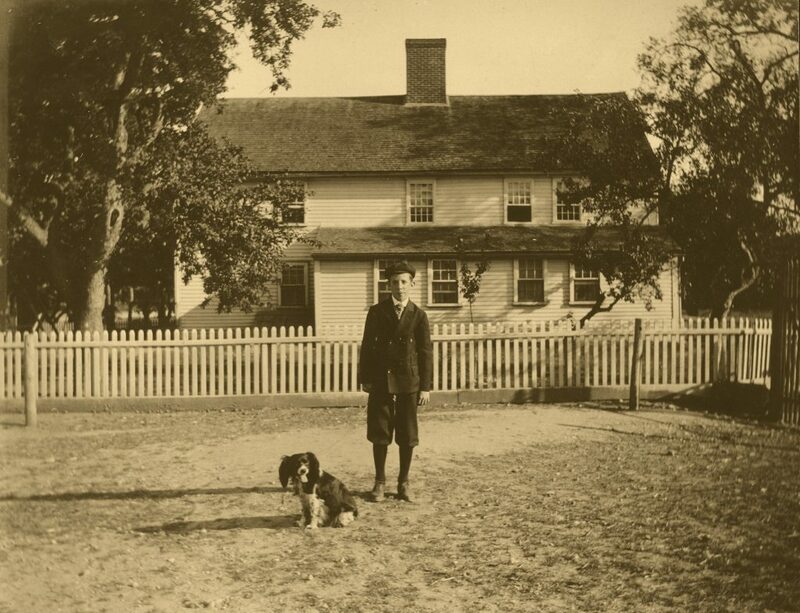 Elisha Smith was a farmer, and he eventually acquired 721 acres of land surrounding the present-day house. In addition to farming, he built two mills on his land. The remains of one of these mills can still be seen today at the rear of the house along the shore of Georgiaville Pond. Elisha married Experience Mowry, and together they had ten children; seven boys and three girls. As the sons got older, the land was subdivided into 100 acre parcels among them. It doesn’t appear the girls inherited any of the land. Elisha died in 1766 and was among the first to be buried in the cemetery located on the grounds of the house. 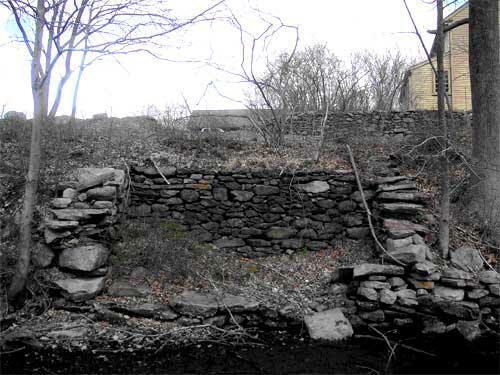 The remains of one of the mills built by Elisha Smith can still be seen today. With Elisha’s passing, the house went to his eldest son, Philip Smith, (b.1703 – d.1792). Philip married Waite Waterman, whose father owned and operated the famous Waterman Tavern in Greenville. 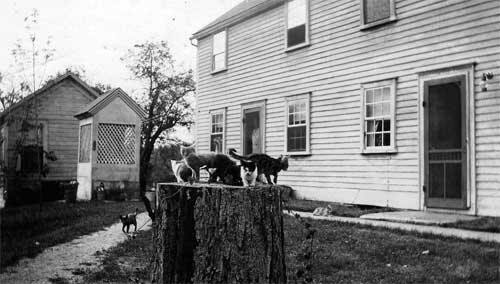 Philip and Waite had seven children and were the owners of the house during the time of the American Revolution. The next owner was John Smith, (b.1736 – d.1807), the son of Philip and Waite (Waterman) Smith. He married Phoebe Ballou in 1761 and they had three daughters. When Phoebe died, John married Waite Brown and they had two sons. John died in 1807 and is buried on the grounds. His will left half of the house and a portion of the farm to his wife, and the other half of the house and some land went to his youngest daughter Waite. 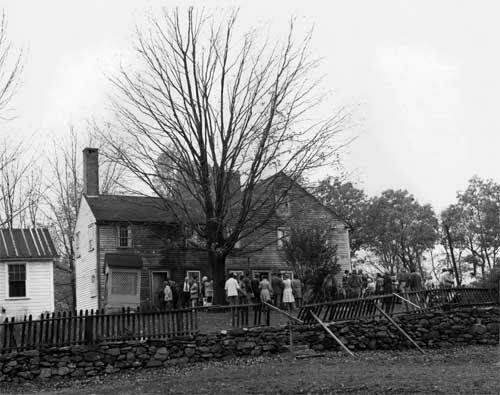 John’s daughter, Waite Smith, married Thomas Appleby on November 14, 1784 and moved to Wionkheige Hill where they raised five children. When she inherited her portion of the Smith property in 1807 it is presumed that she remained at her home on Wionkheige Hill, while her mother continued to live in Stillwater at the family homestead. Waite (Smith) Appleby passed away on October 15, 1843. With Waite Appleby’s passing, the house and property went to her eldest son John Smith Appleby who was born in 1787. He married Patience Harris on June 18, 1809, and moved to the homestead where he farmed the land and ran a grist and saw mill. A blacksmith shop was built later. During this time period the house was also used as a school house to teach the children of Stillwater until a permanent school house was built. 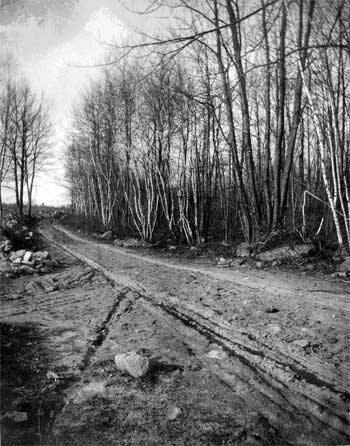 Before 1850, Stillwater Road was located on the southern side of the present-day Smith-Appleby house where the upper end of Georgiaville Pond is today. This means that the rear of the present-day house was once the front and faced the road. This accounts for the rear door of the house being more decorative than today’s front doors. Today, this is the rear of the Smith-Appleby house, but it was once the front. The Federal style door with sidelights was added about 1808/09. Stillwater Road was re-located to its present position to the north of the Smith-Appleby House with the creation of Georgiaville Pond. 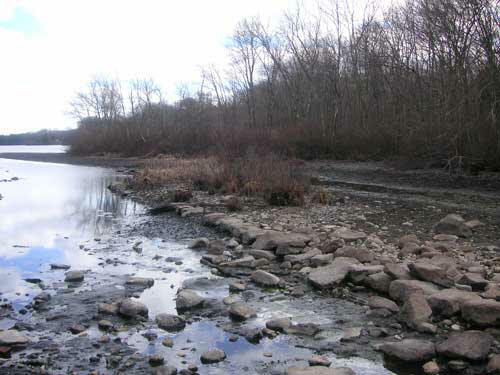 Creating the pond was necessary to supply enough water to power the large mills downriver in Georgiaville, but doing so meant sacrificing the roadway. The remnants to the old road can still be seen today when the level of the pond is lowered every autumn to relieve stress on the dam. This row of stones indicates where Stillwater Road used to be in the 19th Century. The house was expanded during the late 1700’s with two rooms added to the north side and the fire places re-configured. Further rooms were added around 1800 which included an add-on addition to the east portion of the house that doubled the size of the living space. This addition was actually another house that came from Johnston, Rhode Island. In those days, if one wanted to add-on to their home, they had to cut the timber, mill the lumber, and build it themselves. Another solution was to purchase an existing house, dismantle it, and re-assemble it at another site, which was less labor intensive than the first option. A final addition was added about 1830 that includes the present day kitchen area and the room above it. 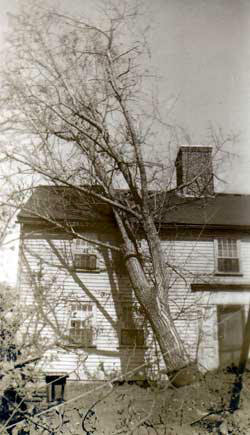 This vintage photo shows the kitchen wing addition that was added circa 1830. John Smith Appleby died May 17, 1857, at age 70, and is buried on the grounds along with his wife Patience and four daughters. With John’s passing, the house went to his Wife Patience (Harris) Appleby who lived there until her death in 1873. The house was then left to her eldest son, John Smith Appleby Jr. who was born August 25, 1830. John Jr. never married but continued to work the farm for the rest of his life. Besides farming, he was active in local politics serving on both the Smithfield Town Council and School Committee. He also held the positions of Tax Assessor and Director of The National Exchange Bank in Greenville. He is said to be one of the most successful farmers in the area. John Smith Appleby Jr. died August 8, 1904, and is buried on the grounds. Since he had no children of his own, he left the property to a nephew, Sidney Merton Appleby, (b. 1846 – d. 1929). Sidney was the youngest son of John’s younger brother Silas Appleby. Sidney had married Sarah A. Cozzens of Cenrtredale on May 21, 1879. 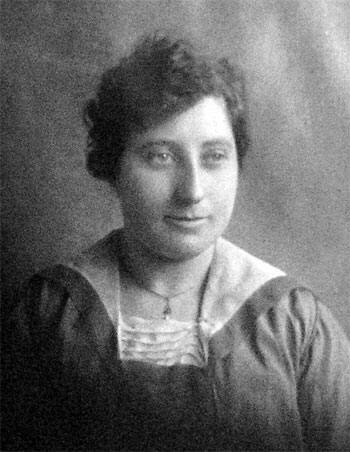 They had one child, Maria C. Appleby who was born January 22, 1888. When Sidney married, he moved to Limerock and worked a dairy farm. Shortly after Maria was born, the family moved to the Angell Farm in Smithfield where Sidney’s father, Silas S. Appleby was living. Sidney’s wife Sarah died in 1890. In 1905, Sidney and Maria moved to the Smith-Appleby House along with two of Sidney’s sisters; Abby Harris, the widow of George Harris, and Clara Appleby who never married. Sidney died December 23, 1929 and is buried on the grounds. With his passing, the house went to Maria. 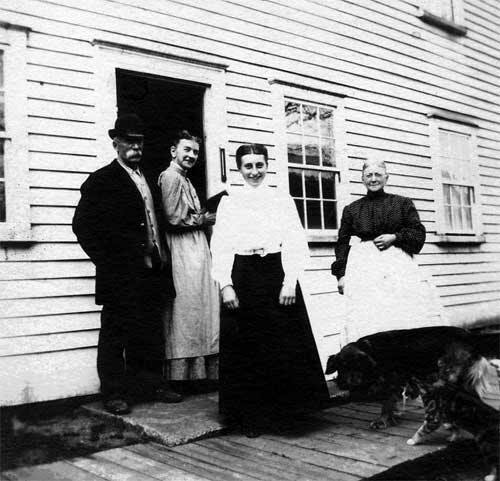 Maria Appleby, center, with her father and two aunts, circa 1905. Maria Cozzens Appleby was a woman ahead of her time. She was well known for her hard work and outdoor activities which included dairy farming and golf. In the 1920’s, she built and operated Smithfield’s only golf course which stood on land now occupied by Route 295. She was aided in her golf course venture by Abbie Sargent, who was a lifetime friend and companion. 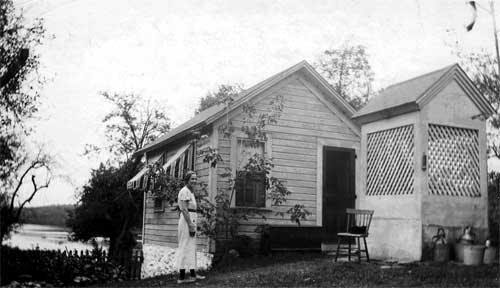 Abbie and Maria lived in the large house together, but as time went on, Ernest Rehill was brought to live on the property as a handyman and grounds keeper. Mr. Rehill lived in the small outbuilding to the rear of the house. Maria passed away on November 3, 1959 and was buried along with the other previous owners and their families in the cemetery on the grounds. Maria’s Will provided for Abbie to live in the house for the rest of her life. When Abbie died in 1963, she too was buried on the grounds. With Abbie Sargent’s passing, the house and property went to a church group that auctioned off the contents of the home and sold the house to a Middletown man. 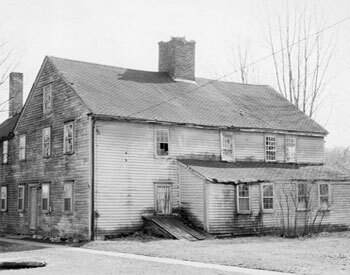 The property sat neglected for many years afterwards until it was sold to the Historical Society of Smithfield in 1976. It took quite a few years to restore the Smith-Appleby House to its former glory, and as one might imagine with a house of its age, maintenance is always ongoing. Some of the restoration work was done by professionals, but the majority was carried out by volunteers. Part of the restoration process included deciding what features to keep. One room of the house still bore original stenciling done in the late 1700’s. Another had a faux marbled floor done in the early 1800’s. Other rooms had their original beaded 18th Century wood sheathing on the walls, wide planked floors, and decorative fireplaces. All of these features were meticulously restored and can still be seen today. The outside of the house required the replacing of rotted boards and sills, along with extensive painting and repairs made to the chimneys and roofing. The grounds had to be cleared of decades of brush and growth, and are today continually maintained by volunteers. Any major repairs to the house are funded mostly through grants and donations gathered by dues and monies collected from special events held at the house. Ernest Rehill continued to live on the property as a caretaker in this building until 2002. Today it is an office. The building which Mr. Rehill occupied dates to the 1800’s. It is speculated that it was originally used for washing and baking before the kitchen wing was added around 1830. A separate building for this purpose made sense to minimize the risk of fire to the main house and to reduce heat during the summertime. It was built into the side of a hill which would allow any wash water to drain away from the foundation. 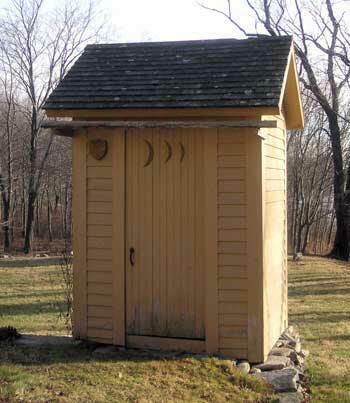 It is also conveniently located near the original well to the house. Around 1989, an addition was added to the rear of the building around which doubled the size of the living space inside and added, for the first time, indoor plumbing. 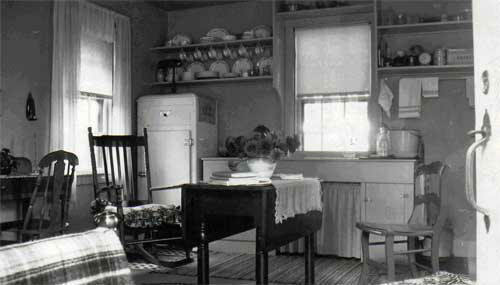 An interior view of Mr. Rehill’s living quarters circa 1950. 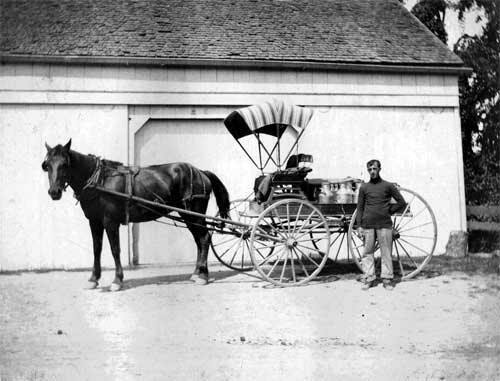 This photo shows a dairy wagon in front of the barn. 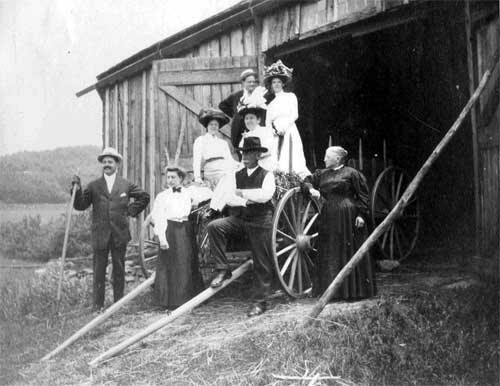 The farm had dairy cows before 1920. This posed photograph dating to about 1910 shows Maria Appleby with her father in the forefront surrounded by people presumed to be relatives. 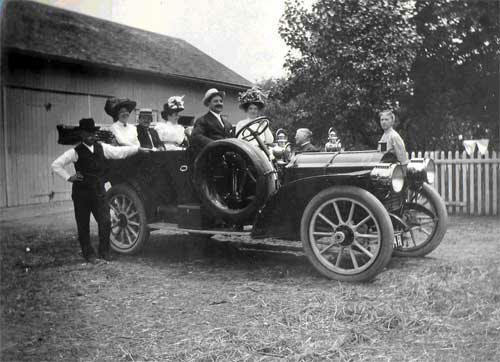 An early automobile in front of the barn circa 1915. 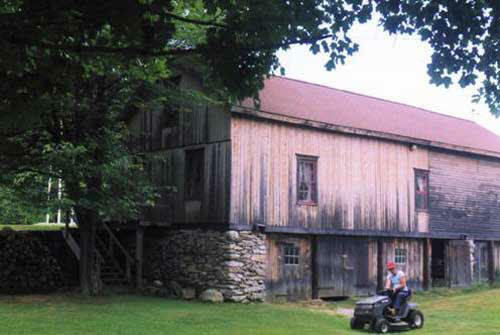 The rear of the barn as it looks today. 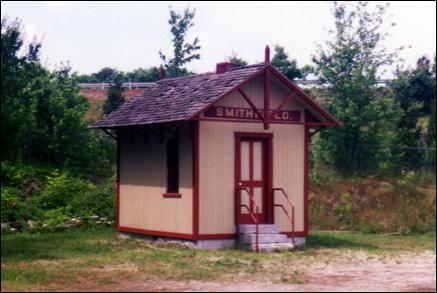 Railroad buffs might be interested to know that Smithfield’s only surviving railroad station sits on the property. It was built about 1873 and was originally located on Brayton Road just off Farnum Pike where it served as a “flag stop” station and post office. 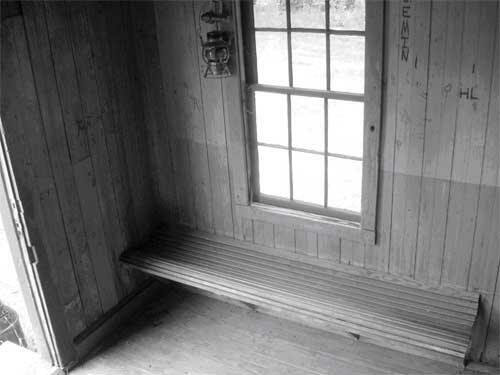 A “flag stop” station was one where the station master would put out a red flag as a signal to the train engineer to stop and take on freight, mail, or passengers. If the engineer didn’t see a flag, the train continued on without stopping. The station was used until 1931 when passenger service along the Providence to Pascoag line was discontinued. Afterwards it sat vacant and fell into disrepair. By the 1970’s it was in poor condition and in danger of being demolished when it attracted the attention of the Historical Society of Smithfield. 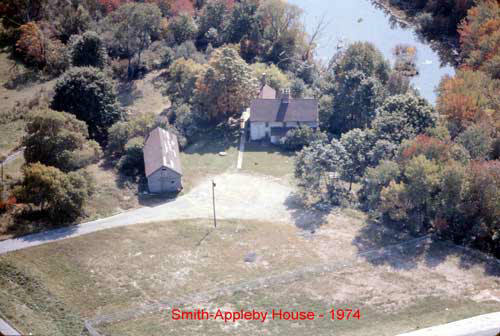 After some negotiations, the station was purchased for $300 and brought to the Smith-Appleby House property in 1975. There it sat for almost five years before it was taken to the Davies Technical School in Lincoln, R.I. and given a complete restoration as part of a community service project. 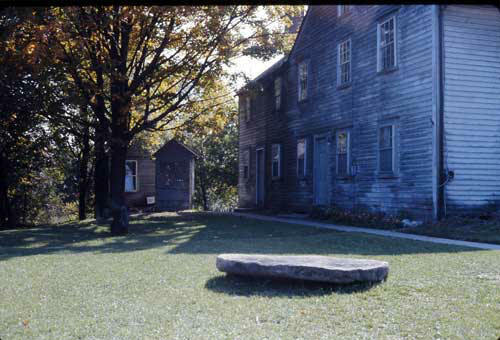 It was returned to the Smith-Appleby house in November of 1980 and placed on a granite foundation. The train station after restoration. One stipulation by the historical society pertaining to the restoration was that the interior should be kept as original as possible. This was done to preserve the character of the building which included initials and dates carved into the interior woodwork by local boys with their pen knifes. The graffiti dates to the early years of the 20th Century and can still be seen today. The interior of the train station was kept in its original condition. Graffiti on the walls dates to 1911. There is a historical cemetery on the property dating to the 1760’s located on a small rise to the east of the house, next to Stillwater Road. Many of the former residents of the Smith-Appleby House are buried here. It’s likely their funerals were held at the home, in a room presently called the “Best Parlor”. The oldest part of the cemetery consists of upright field stones used as markers. Unfortunately, only one of them is marked in any way. 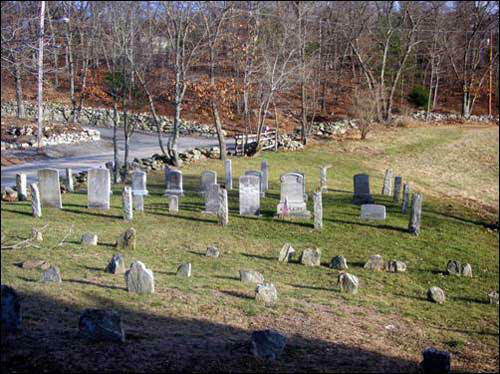 Many early family graveyards were done in this way for a variety of reasons. The cemetery itself is acclimated east to west as was the custom of the day, with the thinking that one would rise up facing the sunrise on the Final Judgment Day. 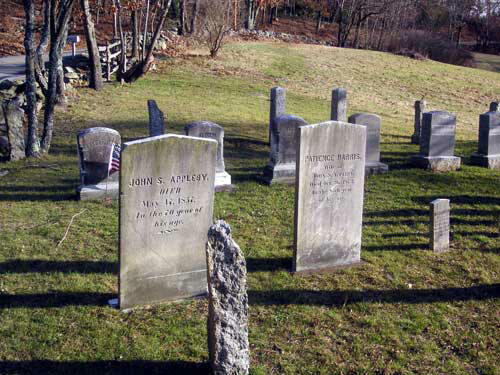 The newer part of the cemetery dates from the 1800’s to 1963 and consists of marked stones, including those of Maria Appleby and Abbie Sargent, the last two people to be interred there. The graves of John S. Appleby and his wife Patience (Harris) Appleby. The well on the property sits conveniently between the old cook house and present-day kitchen. 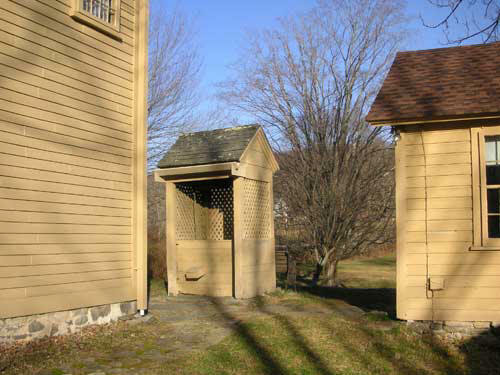 Before the days of indoor plumbing, this privy served the needs of the Smith-Appleby House residents. It was restored by Howard Lebeck in 1988. 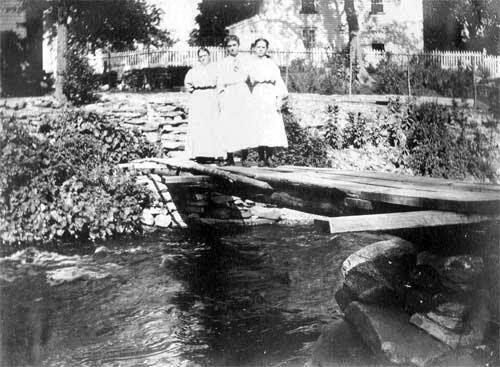 Fishing behind the Smith-Appleby House circa 1910. 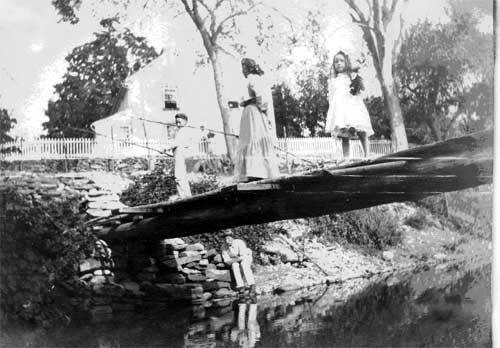 The bridge across the river that once ran behind the house, circa 1910. 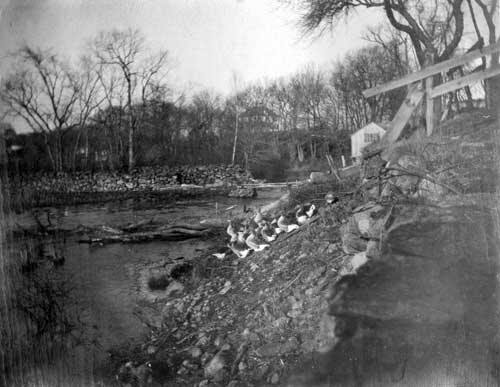 Looking towards the stone dam behind the house, circa 1910. The house barely visible through the trees was moved to Capron Road at Stillwater Road to accommodate the construction of Rt. 295. 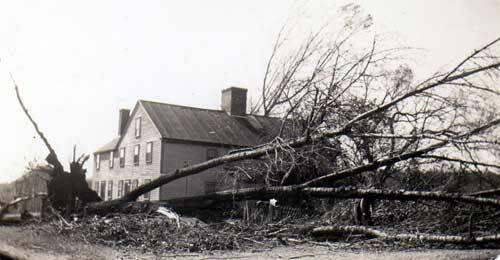 The Smith-Appleby House after the Hurricane of 1938. 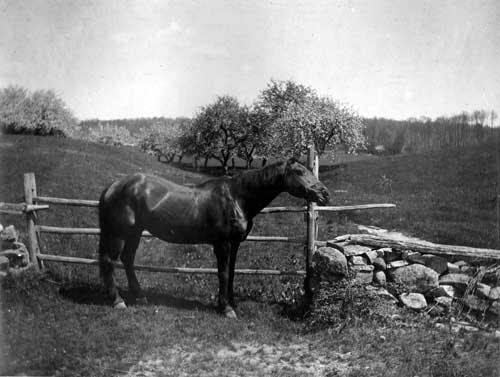 A horse owned by Maria Appleby with apple orchards in the background, circa 1910. This view is looking towards Capron Road. Today Rt. 295 runs where the apple orchards were. 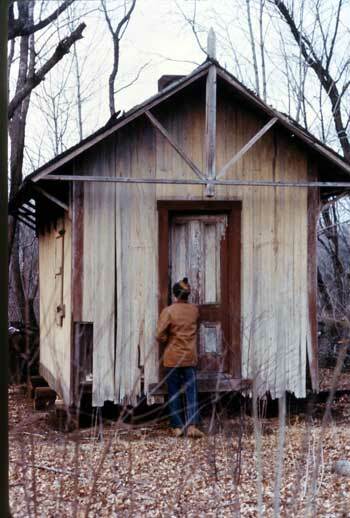 The house before restoration, circa 1977.